I normally keep at least one sympathy card in my stash but this week, when I needed one, my cupboard was bare. This left me in the terrible position of creating a card while fighting back the tears - not an ideal situation. My incorrectly stamped butterfly from You Move Me - I corrected it later! 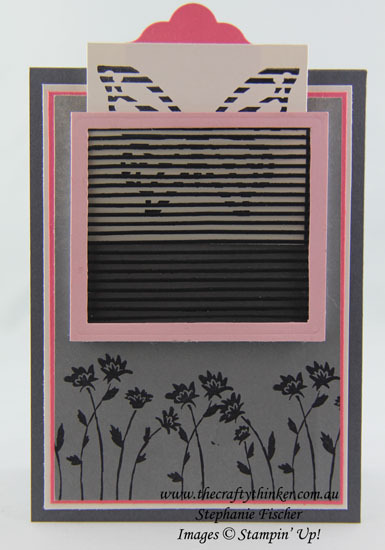 So I used my You Move Me bundle for the first time along with the hostess set, Background Bits. I made an error in my use of the You Move Me stamps - when I took these photos, I had not yet worked out that the process required stamping both of the butterfly stamps! Eventually I worked out why my butterfly wasn't fluttering very much and corrected the situation. I will add a little video of the corrected version as time allows. 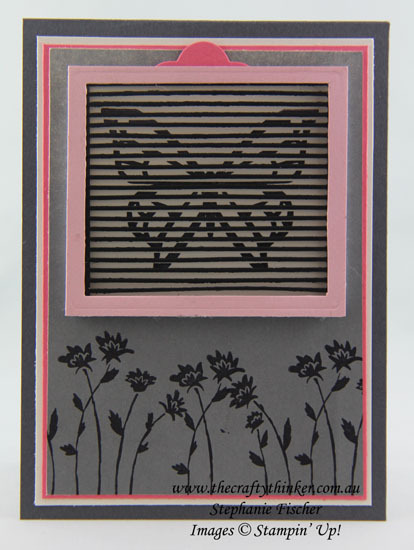 I used the Sponge Brayer to add Smoky Slate ink to Very Vanilla card (a heavier coating at the bottom of the piece) before stamping the flowers in Basic Black. I added a piece of window sheet behind the "grill" to provide some longevity - I was worried that the tag might catch one of the horizontal strips. I also added a pink frame by another grill and then removing the horizontal strips.